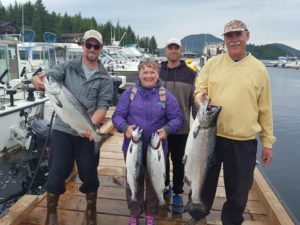 To get the best out of your time with us we want you to come prepared, especially if this is your first time fishing for salmon in Ketchikan. So, read on to learn some Alaska salmon fishing tips and what to expect from your salmon fishing adventure. 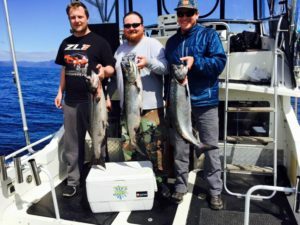 Obviously, you will want to make the most of your Ketchikan salmon fishing trip, so you will need to time your trip to coincide with when the fish are biting. Luckily for you, this is not too hard to do. 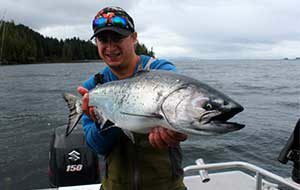 King salmon will run thickest through the last two weeks of June right through to the first week of July. Fishing for Coho provides a relatively large window of opportunity. Coho start running in August and go right through until October. Don’t be surprised if you find yourself hauling in a beautiful 20 pounder, which is sure to earn you some bragging rights back home. August is also the best time to catch Pink and Sockeye Salmon. These fish are on the smaller size compared to other salmon species, but don’t expect to land one without a decent fight. Your best chance of catching salmon will depend on your knowledge of the area, the weather, and historical fish patterns. And our awesome guides will provide you with all the information and equipment to help you catch an Alaska salmon. Salmon are a species of fish known as anadromous, which means they are born in fresh water, live out their lives in salt water, and return to fresh water to spawn. Before traveling upstream to the spawning grounds, salmon need to readjust their bodies to fresh water, so they will spend some time at the mouth of streams where fresh water meets salt water. Naturally, this little quirk of nature creates lots of opportunities for the sport fisher to catch some salmon. Salmon have a 300-degree field of vision, which means they can see all around them except directly behind. Such a massive advantage in peripheral vision no doubt adds to the challenge of catching such crafty prey. Humans love a bit of salmon, but so do bears, who instinctively know when to head to the streams to catch their fill every year. Salmon are vital to the bears’ survival because, without salmon, bears would be unable to build up a sufficient amount of fat stores for the cold, sparse winter months. Salmon diets change as they mature; young salmon feast on plankton, while mature salmon subsist on a diet of insects, small fish, and small invertebrates. For the most part, Alaskan salmon spawn only once in their lifetime before dying. Males usually expire right after spawning, while females tend to die as soon as they have laid their eggs. Salmon spend most of their adult life in open waters preparing for the trip back to their birthplace. The journey is grueling and physically exhausting. The trip upstream provides little to no opportunity for feeding, and a salmon’s “genetic programming” has turned off most processes that maintain the body. By the time the salmon have reached the spawning grounds they are physically spent, and their bodies rapidly fall apart once spawning is complete. To catch Alaska salmon, you will need flies that are large and brightly colored, a rod and reel, good strong line (20 lbs. strength if you’re going for the bigger species such as King), hooks, tackle, and bait (live works best). When you first feel a bite don’t be tempted into jerking the line. Allow enough time for the fish to fully engulf the bait before using a gentle tug to set the hook. Use a rod holder. Salmon fishing often requires patience and timing. Be sure to move the bait up and down periodically, so you spread the scent and make the bait more attractive to the fish. After you throw your line, don’t let the hook rush to the bottom. Letting the line out gradually while pausing briefly every 50 feet or so will prevent tangling. 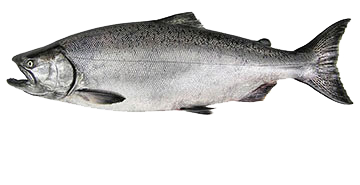 Also known as “Chinook” is the largest of the salmon species. The King is a beast of a salmon, with 30 and 40-pound catches not uncommon. Some anglers have reported catching King in sizes exceeding 100 pounds, with the state record currently sitting at 126 pounds. 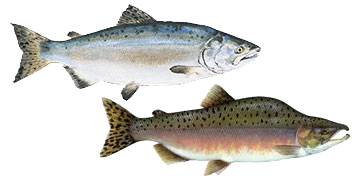 King salmon are usually red, with black spots all along their back and tail. Flavor wise the King has a buttery taste and is also known for its high oil content. 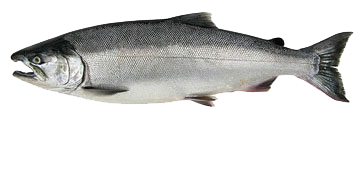 The Coho has a distinctive silvery hue along its sides, and its flesh is the vibrant red for which salmon are well known. 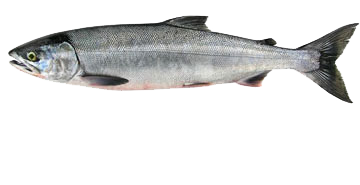 Coho is also the preferred salmon for chefs all over the world. Size wise the Coho sits a distant second to the King and ranges in size from 8 to 12 pounds and 24 to 30 inches. They are quite popular with fisher-folk due to the energetic fight they put up when snagged. The common consensus among fisher-folk is that Sockeye, or “Red” as they are also known, are the best tasting Alaskan salmon. Sockeyes are in the 6-pound range and are around 20 to 24 inches in length. 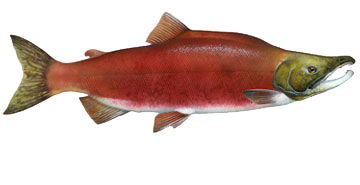 Sockeye meat retains its vibrant pink color even after cooking, which helps to make it highly desirable. Chum salmon develop a greenish-blue color with black spots along their back before spawning season. Male Chums also develop large teeth, not dissimilar to canine teeth in appearance, during spawning. Chum will spawn closer to saltwater due to their inferior jumping ability when compared to Coho. Pink salmon, or “Humpies,” are the most abundant species of Alaskan salmon but are the smallest in size. Despite their diminutive size, the Pinks still pack quite a punch when you get them on the end of your line, so it’s still a fight worthy of the struggle. Most pinks will reach 3 – 5 pounds, with a few exceptions able to push the scales all the way up to 14 pounds. The “Humpy” nickname stems from the pronounced hooked snout and humps visible on males during the spawning season. 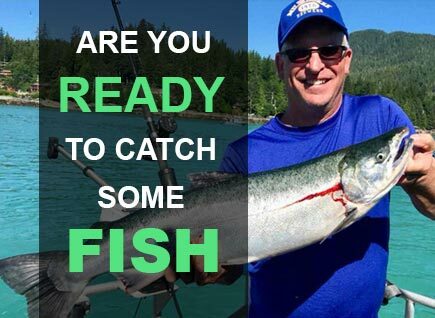 Are you ready to catch Salmon in Alaska?